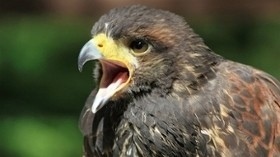 Three birds of prey have been stolen during an early-morning break-in at a visitor centre.Police said two Harris hawks and a red-tailed hawk were taken from Loch Lomond Bird of Prey Centre, which is within Loch Lomond Garden Centre, near Balloch, West Dunbartonshire. The break-in happened between 3.30am and 4.30am on Friday and it was reported to Strathclyde Police at about 9.20am. The centre, which has more than 30 birds, provides information about birds of prey and offers a falconry experience to visitors. It also operates as a rescue and conservation facility. Detective Sergeant Martin Penny, from Dumbarton police office, said: “Extensive enquiries are ongoing in the local area to gather more information on this crime, those responsible and the car that they made off in. “Officers are also currently studying CCTV footage to establish more details on this crime. Anyone with information should contact Dumbarton police office on 01389 822000 or Crimestoppers in confidence on 0800 555 111.